Rome at War deserves more love. 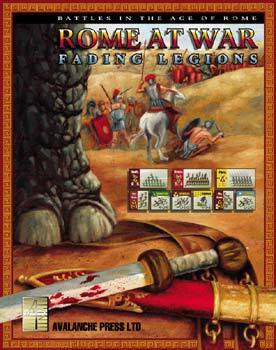 Fading Legions is a really fine game based on three different 4th Century campaigns. Here’s what’s behind that elephant foot on the box cover. Fading Legions presents the battles of Julian the Apostate, Rome’s last pagan emperor, plus a couple of other battles from the decades just after his death. These are the armies of the late Roman Empire, composed mainly of Germans, Goths and other non-Latin peoples and supposedly less enthusiastic about their duty than the legions of pervious centuries. While the legions are less powerful than those of old (they’re much smaller) their morale remains strong, which is a good thing since Rome still resists a combined-arms approach. The heavy infantry remains the backbone of a Roman army, with only small contingents of heavy cavalry, horse archers and even camel archers brought along to the battlefield. The empire may be fading, but the game title’s a little misleading – Rome is not crumbling because of her legions. Her leadership, well, that’s a different story. In Fading Legions, Rome faces three distinct enemies. In the first scenario, Julian (then still the Caesar of the West) faces a coalition of German tribes led by King Chnodomar. Chnodomar and his second, Prince Serapion, are good leaders with an army consisting of heavy infantry war bands and heavy cavalry. There is a unit of German archers in the counter mix, but for some reason it is not used in the scenario. The Battle of Argentoratum in 357 AD was a signal victory for Julian, and it is the only scenario from this campaign included in the game. Next, Julian faces the Sassanid Persians in four scenarios with his successor, Jovian, in charge for one more. The Persians have masses of low-quality infantry bunched in phalanxes, but depend on their elephants and heavy cavalry for shock action. While their infantry is no match for Rome’s legions, the Sassanids have built a combined-arms force that also includes plentiful light infantry skirmishers and archers (on foot, on horseback and on camelback). While the elephants are pretty awesome (every game should include elephants! ), it’s the armored cataphract cavalry that give the Persians their punch. The Persian scenarios are a lot of fun because of the interplay between the two very distinct weapons systems: Rome has crack heavy infantry and pretty weak cavalry, while the Persians have very good cavalry and abysmal infantry. Each player has to seek out his enemy’s weakness and play to his own strengths, which usually favors the Persian because of his cavalry’s mobility – but the Roman infantry is so much tougher than any other units on the board that it can chew up an incautious Persian in short order. The seventh scenario does away with this calculus: Roman fights Roman (with a contingent of Visigoths helping out one side) as Procopius and Valens square off to decide who will rule the Empire. In the actual event the Visigoths did not show up in time and some of the legions switched sides to join Valens so Procopius fled, only to be run down and killed by Valens’ men. In our imaginary battle it’s mostly legion against legion, a very different sort of battle from the others in the set. The final four scenarios are set in the disastrous Gothic War, as Rome manages to turn allies into enemies and get its Eastern Army and Eastern Emperor killed off in the process. The Goths come in two flavors, Visigoth and Ostrogoth, but somehow we managed to give neither of them black as their background color. The Visigoths are mostly barbarian heavy infantry, and are actually pretty good. They have some archers (foot and horse) and light infantry to help out as well. The Ostrogoths are heavy cavalry, with a handful of their own horse archers plus some allied Alans and Huns. The game system is pretty straightforward. The map is divided into roughly square areas, which suits the linear nature of combat during this period. Armies activate by formation, and are highly dependent on their leaders for this. Combat consists of dice-rolling, with a result of 6 getting a hit and reducing an enemy unit by one step. Cavalry and elephants can charge, and sometimes barbarians can, too. Units are rated for morale and have a number of strength levels; a legion with strong morale and many steps of strength is much more capable in battle than a similarly-sized horde of barbarian warriors. All told it’s a pretty simple game system that fits together into a surprisingly sophisticated model of ancient battles. The pieces are designed to look like miniature armies marching across the battlefield, and they do indeed look that way. The legions, phalanxes and barbarian warbands are on big pieces, 1.33 inches long by two-thirds of an inch high (33mm x 16.5mm for those in distant lands). Leaders, cavalry, light troops, elephants and a few other specialized units are on square pieces 2/3 of an inch on a side. The maps are, by contrast, pretty bland. Ancient battlefields were rarely very interesting places, as the Romans sought out big flat spaces to maximize the advantages of their legion discipline and the Persians did the same to maximize the advantages of the heavy cavalry. The units pop off the background very nicely, though. We’ve supported Fading Legions with some Daily Content, though not as much as it deserves. Soon it will get a lot more support in the form of King of Kings, an expansion book with more scenarios and more pieces. Put the legions at your command! Order Fading Legions right now! Mike Bennighof is president of Avalanche Press and holds a doctorate in history from Emory University. A Fulbright Scholar and award-winning journalist, he has published over 100 books, games and articles on historical subjects. He lives in Birmingham, Alabama with his wife, three children and his dog, Leopold. Leopold eats lizards.